Kosovo has prevented a Serbian train from crossing the border between the two countries, with allegations it was prepared to blow up the track. The inaugural service from Belgrade to northern Kosovo was heralded as an important transport link by Serbia. 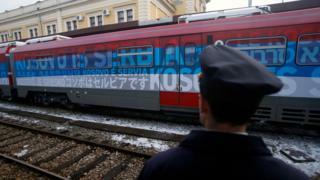 It said the slogan "Kosovo is Serbia" painted on the train was a celebration of cultural heritage. But Kosovo, which declared independence from Serbia in 2008, saw the train as an act of provocation. The Russian-made train had been decorated with large images of Serbian Orthodox religious icons from famous monasteries in Kosovo, while hostesses were dressed in Serbia's national colours. "This is like a mobile exhibition presenting our cultural heritage," declared Marko Djuric, who heads the Serbian government's office for Kosovo, ahead of the trip. The train was due to travel from Belgrade to Mitrovica, in northern Kosovo, where most of Kosovo's remaining ethnic Serbs live. Currently, it takes 10 hours to travel by train from Mitrovica to Belgrade, and Serbia says it hopes to establish a direct service. Neither Serbia nor Russia recognise Kosovan independence, which was declared nine years after a war between separatists and the government in Belgrade. But Serbian Prime Minister Aleksandar Vucic ordered the train to stop in Raska on the Serbian side of the border, saying Kosovan special forces were trying to blow up the track. Kosovo, which Serbia claimed was planning to arrest the driver if the train crossed the border, has denied the accusations. However, Kosovo Prime Minister Isa Mustafa, who contacted the US and the European Union to express his country's concerns, said: "I believe that turning back the train was the appropriate action and its entry into the independent and sovereign Republic of Kosovo would not be allowed." Mr Vucic accused Kosovo of overreacting, telling a press conference he decided to stop the train "to show that we want peace". "We sent a train, not a tank," he added.